This large, former Ford foundry site was to undergo redevelopment to include a new Morrisons Supermarket, hotel, offices and industrial units. VertaseFLI was contracted to undertake the demolition and remediation works including the provision of a development platform. Acting as Principal Contractor and responsible for all works, VertaseFLI attained all the relevant permissions and permits including the Remediation Strategy Environmental Permit, notifications of asbestos removal and extensive negotiations for road and rail line closures to facilitate demolition. 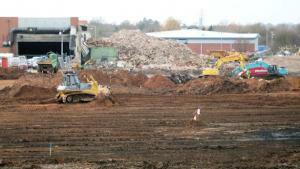 VertaseFLI managed specialist asbestos and demolition sub-contractors and prepared all the necessary H&S information. All other works, including additional site investigations, soil treatment using bioremediation and chemical stabilisation, groundwater treatment including free product recovery and earthworks and ground improvement works were undertaken in-house and to a strict programme. Several large above ground and underground fuel storage tanks. 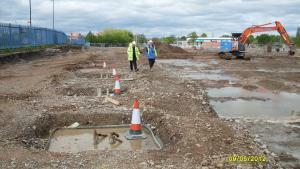 Works co-ordinated with Network Rail and the Highways Agency. Early phased release of part of the site to allow for early development. In spite of these issues the project was completed on time and to a very challenging programme.